Don’t start shooting blindly on the first round. Try to figure out who is who, while at the same time try to keep people guessing your role. Build up your weapons and defenses before going to war. Once the action starts, look for easy kills by waiting until someone is down to 1 life and/or card left. Indians are a great way to finish someone off after people are depleted. Wait, wait, wait, before you show your black mask and spend the time building up and finding out who your brothers are. If you know that the Sheriff is surrounded by your partners, then go straight for the kill and ignore all else. Otherwise, play it by ear and see if you can kill the deputy or renegade with out giving away your role. If you can’t kill the minor opponents then try to jail them as you Bang! the Sheriff. Build up your defenses in the beginning if allowed. Be DAMN sure who is who before you start shooting at people. You don’t want to hurt your allies. However, if someone takes a shot at you, bring the whiskey and a bible cause they are going down! Only use mass hurt cards, like Indians and Gatling if the outlaw is down to one and your allies are not hurting too bad to get those cards from killing the Outlaws. Don’t float the dynamite; you might get yourself or a deputy. It is better to discard it during your draw down if possible. Get your deputies on each of your sides as a buffer. Don’t shoot the Sheriff. You would be surprised how many newbies actually do this on their first turn before the Sheriff can say “your an idiot”. Try to shoot your way towards the sheriff. That is, you want to be sitting next to the sheriff in order to be a buffer between him and the “bad guys”. Sacrifice for the cause. Even if you die, but the sheriff lives, you win. If you can arrange it, weaken an outlaw and let the Sheriff take the kill. That way he gets the three cards as a reward. Also, as with the sheriff, don’t send out the dynamite. That is a black hat tactic! If the outlaws are dead and you don’t know who the Renegade is, then just start killing anyone. This will leave the Sheriff in a strong position to deal with the Renegade and you still win. The renegade should be called the "great deceiver" because it's his job to look, smell, and act like a deputy for the first half of the game (get beside the sheriff, protect him, and don’t shoot other deputies). You want to attack the outlaws just enough so that they can also hurt the “good guys”. Keep a perfect balance of attrition for both sides. 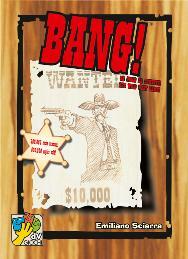 Then, at the right moment after the outlaws are dead, show your true colors and slam the sheriff DEAD! Keep in mind, that if you have done your job right and the last of the outlaws have been removed, there will be a pause for a round while the 3 or 4 of you figure out which one is the “new” bad guy. Hopefully, you might be able to “meta” the others into thinking that one of the deputies is the Renegade.